Replaceable, soft, silicone mouthpiece offers comfort and durability. Vented, silicone flex tube. Curved air tube. 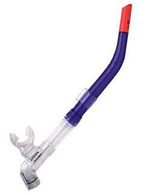 Adjustable snorkel-keeper.